Sustainability is top of mind as this week we mark Earth Day and Arbor Day, tributes aimed at raising respect for the environment. That makes this the perfect moment to note a new Natural Resources Defense Council (NRDC) report that says, "Brands that place packaging" into commerce must take more responsibility for its life cycle impact. Packaging as time-sensitive news? It may sound like a boring topic, but without packaging, more food would be wasted. Granted, food waste is already at critical levels, with more than 30 percent of food in the U.S. being wasted annually, according to National Geographic. But packaging plays a positive role in this equation. It protects food from early spoilage and helps extend its life by keeping it safe from contaminants and other external threats, notes an expert from Ohio State University. Nevertheless, we must continue to work together proactively to reduce waste, food waste and packaging waste. Here is the crux of the issue: As we surge toward a mostly urban world population of more than 8 billion by 2030, according to strategy consultancy Roland Berger, the middle class will more than double to almost 5 billion, notes Reuters. More people with more spending power buy more products, which puts more packaging in the waste stream. In an ideal world, we would have fully sustainable packaging that is completely renewable and 100% recyclable with zero carbon footprint, and everyone would recycle all their waste. That scenario doesn't exist yet. But adopting a two-step approach of using packaging that is more sustainable and being conscientious about recycling packaging can help start to change the waste equation. One challenge lies in motivating businesses to embrace these practices given current realities. Although the global packaging market is projected to reach $975 billion by 2018, according to packaging consultancy Smithers Pira, only $244 billion of that expenditure will come from packaging with better environmental profiles, notes award-winning, green-packaging consultancy PulpWorks. This means only 25 percent of global packaging would meet today's criteria for sustainable packaging. And all of the above should help with the waste equation in some way. Although we must make certain that packages can be recycled, ensuring we avoid waste during the design and manufacture of packages is critical. For example, packages that are made from sustainable and renewable materials--those that can be replenished over time--are lightweight, and therefore use a minimal amount of them help reduce waste of valuable natural resources. 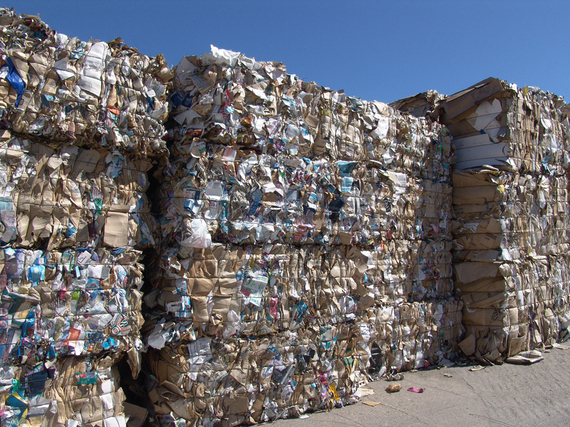 Recycling is a well-known practice to divert waste from landfills. However, it remains underutilized by consumers and businesses in the U.S. In fact, America "has one of the lowest overall recycling rates of any developed nation. We recycle only half the packaging we use," says NRDC Executive Director Peter Lehner. Part of the problem is some packaging is difficult or impossible to recycle. Another concern lies in the U.S.'s underdeveloped recycling infrastructure; many communities don't have curbside programs for collecting and recycling their post-consumer packaging, notes Lehner. In response to recycling concerns, the carton packaging manufacturers Tetra Pak, Elopak, Evergreen and SIG Combibloc came together to found the Carton Council in 2009 to increase carton recycling in the U.S. Besides ensuring end markets and sorting infrastructure for carton recycling are in place, education is a large part of this effort since it is equally important to motivate consumers to use recycling bins. Today, 54 percent of American households are able to recycle cartons--a number we hope continues to increase. According to PulpWorks, the drive to make packaging more sustainable and recyclable will continue to grow in importance and is predicted to become the No. 1 global challenge facing companies--even more than costs--by 2023. And it is particularly important to Millennials, who "view taking care of themselves and the environment as one and the same," notes a Brand Amplitude study. As more companies connect environmental awareness with their bottom lines, and feel the heat of consumer opinion, those that embrace more sustainable packaging and play an active role in driving recycling will help achieve a lasting impact on the environment. The good news is that options for more sustainable packaging and opportunities for collaboration to drive recycling already exist, so we can start today.